Remember most bicep exercises also work your forearms so you may not need to do lots of exercises that isolate only your forearms. Summary: This is a great bicep exercise that provides the foundation for your bicep and forearm routine. I am discussing how this can be done with one arm at a time, but you can also perform it lifting both dumbbells at the same time, or use a bar instead of dumbbells. How to: Grip your dumbbells with your arms straight and down to your sides, now begin lifting the dumbbell bending your arm at the elbow with your palms facing upwards. You can now release the dumbbell lowering it back to your side. I like to lift the dumbbells one at a time so that I am not using my body to hoist them up to the top position. Make sure you keep your knees just slightly bent and your body still letting the arms do the work. Summary: This is a exercise is great for building both the biceps and forearms. I like to do this after I’ve done a couple sets of bicep curls because it seems to work the forearms a bit more than the biceps. How to: Grip your dumbbells with your arms straight and down to your sides, now begin lifting the dumbbell bending your arm at the elbow but this time keep your hands in that same starting position making sure you do not rotate your palms up. Usually you will also move the dumbbell a bit inward toward your chest instead of lifting it straight up. Summary: The stretch band can be used for various exercises, but it is really great for building your biceps. You can get stretch bands with handles that have anywhere from 1 to 3 bands, and they are typically very inexpensive. 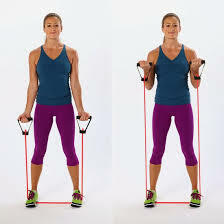 I like to do the curl with one arm at a time, but you can stand on the bands and use both arms if you like. How to: If you chose the one arm version make sure you have one of your feet stepping on the stretch band somewhere near the middle, gripping the handle lift the stretch band up in the same motion that you did for the dumbbell bicep curl, and slowly lower it back down to the starting position. By slowly lowering your hands down you are taking advantage of some negative resistance and making the exercise harder than if you just quickly came back to the starting position.